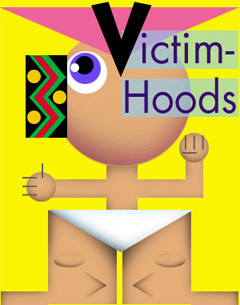 When your self image is built on a foundation of victimhood, you need to perceive daily instances of oppression to re-affirm your chosen identity. PIG refuses to be a slave to the hypersensitivity of these cringing cretins who don't have the 'NADs' to conduct their lives as individuals. If they choose to wrap themselves in a cocoon of hypersensitivity...If they choose to cower behind a baseless notion like a group identity built on the quicksand of such immutable, utterly irrelevant, characteristics as skin pigmentation, sexual orientation, ethnicity or gender, it's their problem, not ours. Quite frankly, PIG has had it up to here with their relentless whining. Borrowing a line from the movie, 'Network', we freely admit: "We're mad as hell and we're not going to take it anymore." Other sections of PIG deal with group think and the tribal identity in broader terms. Here, in the Victimhood, PIG deals with America's resident, Victocrat tribal groups, individually. PIG's legendary anthropologist, Whitey Patriarch, will teach you each tribe's mantra...their tribal attitudes and sensitivities, their tribally-correct speech, their tribal dress, even their tribal thinking - a one-size-fits-all set of authorized multi-purpose responses. In this section, you'll encounter each stripe in this properly-hyphenated rainbow of sniveling self-pity. Grab your preferred adult beverage, keep your sense of humor handy, and join us on a visit to the reality-insulated realm we call the Victim-'Hood.